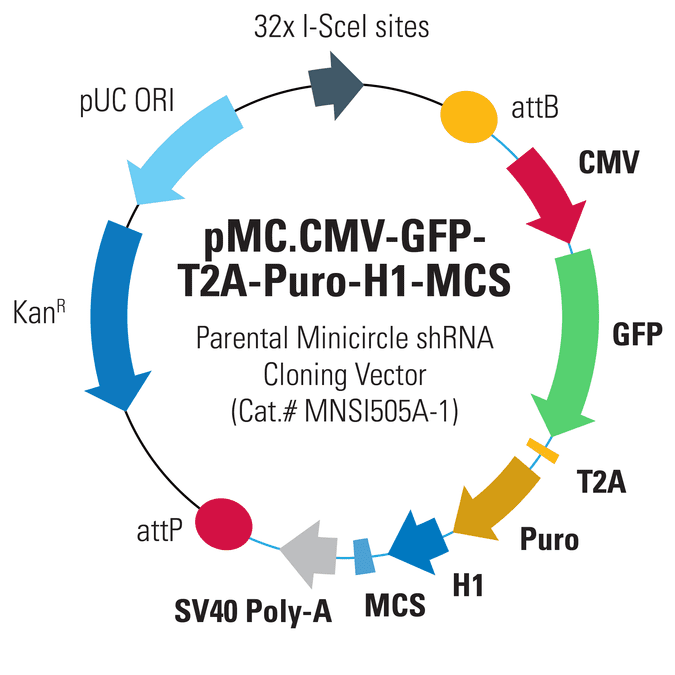 Deliver shRNAs to cells with minicircles produced from the pMC.CMV-GFP-T2A-Puro-H1-MCS Parental Minicircle shRNA Cloning Vector and get all the advantages of Minicircle Technology. With your shRNA driven by the strong H1 shRNA promoter and both GFP and puromycin resistance for selection of transfectants, you can deliver your shRNA-of-interest episomally on an efficiently-transfected plasmid that is free of foreign DNA. The pMC.CMV-GFP-T2A-Puro-H1-MCS Parental Minicircle shRNA Cloning Vector co-expresses the GFP and puromycin resistance selection markers via the strong CMV promoter.